CraftygasheadZo: WOYWW 356 - What? Again?! Really?! I think I've lost a few days. I haven't finished visiting desks from last week and yet, here we are again! WOYWW is a wonderful world of desks and friends - real life ones as well as friends we talk to online. For me, WOYWW has been a constant. No matter how I am it is always there. And so are the friends. A simple word. A virtual hug. Always there for me. I've not been so good. February and March have blurred into one. I'm resting and coping, but still. 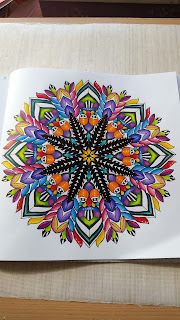 I've done very little crafting though have found colouring to be a great therapy. It's helped me cope with the pain. Giving me a focus. As said I've been colouring. Using my Prisma pencils I've finished these pages. The colouring books are Wild Savannah and the Secret Garden. I've bought quite a few of these posh colouring books!! The other thing to be found on my desk is Baxter. Once again he grabbed the opportunity to chill out and watch the world go by. Well the desk is empty he seemed to say to me! I have managed to go to footy a few times. Thank goodness for my wheelchair and my mum who pushes me around so I can meet up with friends in the bar before the game. Mum's not bothered about the football, but she comes so that I can still go now that Keagan has moved away. A pre-match selfie! Hi Zo. 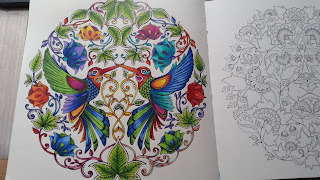 I really love your colouring and am so pleased the crafty therapy really helps you. I'm sure lots of us use our crafting to get us through the day for one reason or other and, like you, I value the friendships made through blogging very highly......they are such a lovely bunch out there aren't they? Hello Zoe. Oh, how true that WOYWW friends are there all the time. I hadn't managed to post earlier this year - and got an email from Neet checking all was well, and that hubby was still alive!!! It meant so much to me. I'm sorry you have had such a struggle this past two months - do you usually begin to feel a little better as the weather improves? Trust you may! 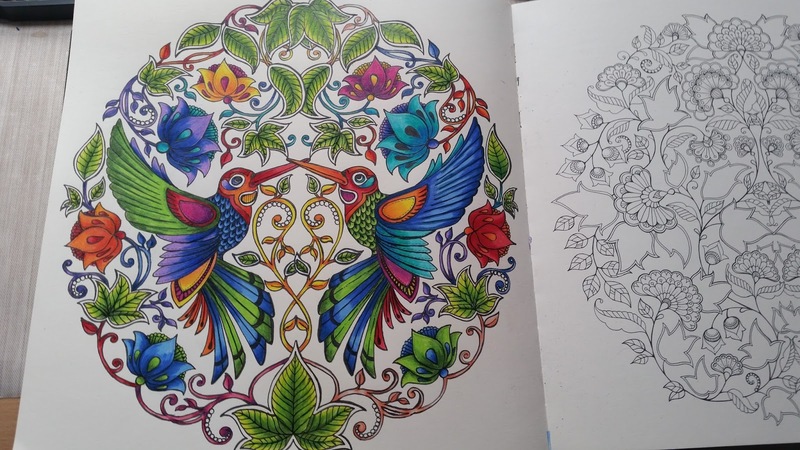 Your colouring is beautiful - some of these colouring books really are amazing, aren't they? I bought the secret garden one for hubby - but I don't think he has started it yet.... best remind him. As you say - good therapy! Glad you are able to still get to some of the football. Enjoy. 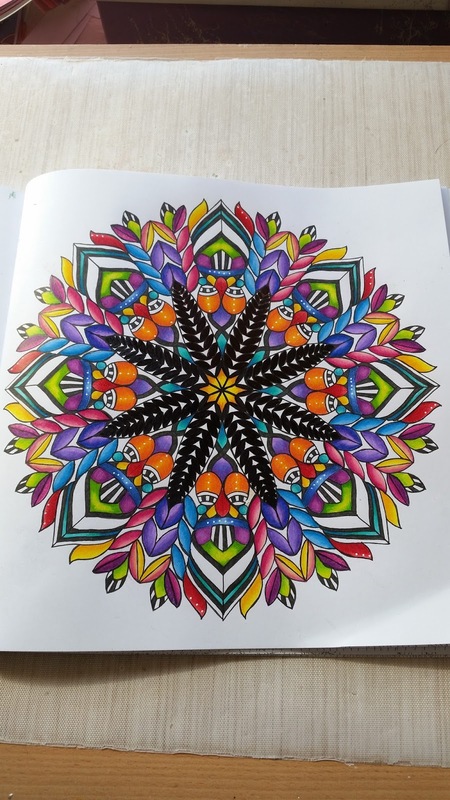 Your colouring is beautiful, Zoe and it's great that you find it to be good therapy. 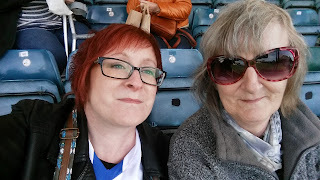 Bless your Mum for taking you too the footie, you certainly look like each other!! I'm sorry to hear you are having such a rough time. 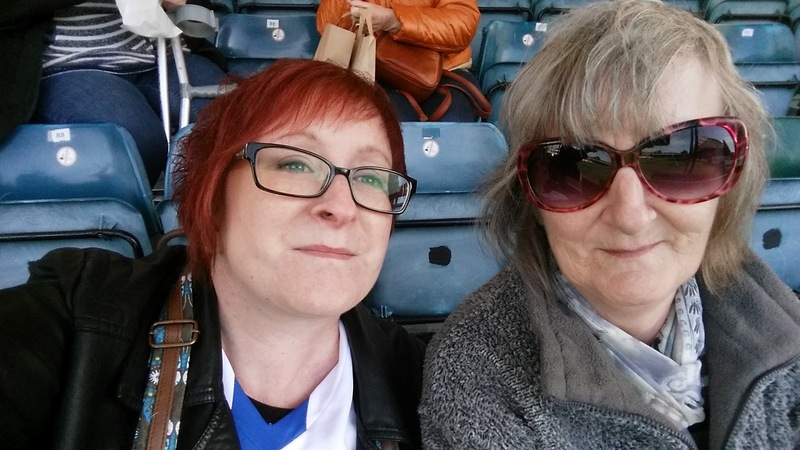 Football is a great distraction, and so good of your mum to take you to a match even though she doesn't care for it. Your colouring is beautiful! I can well understand it is good therapy. Happy WOYWW and hang on in there! I'm so you've had such a rough time lately. I hope things start going uphill. Sending you hugs!! Beautiful colouring. It can be quite relaxing and therapeutic. Sorry you aren't feeling so good but glad you have your mum around to help and give you support. Sorry I've not been around Zoe, but I'm guessing from your post you've been having a bit of a rough time. Thank goodness for crafting and the internet eh? Hope you feel better soon. I got three big colouring books for Christmas but have only dipped into them so far. Maybe I need some new prisma pencils to get me started hee hee. Your colouring is lovely but no surprise there! Happy WOYWW Cindy #27 and sending a virtual hug. I'm so sorry you haven't been feeling so good - I hope you are now beginning to feel a bit better. I love your colouring, that one with the birds should be framed, it's beautiful. I saw the Secret Garden book in Waterstones the other day - it really is gorgeous! Hope your feeling and coping better at the moment! Thanks for visiting. 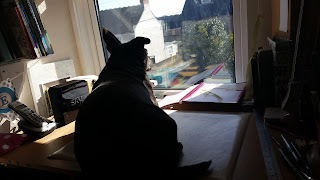 I played some catch up peeping about your blog. Here I love the colors you are using on these beautiful papers. Your Baxter and my Baxter (a cat) seem to have the same habit. Glad to hear you are out and about, always good to be with people. Prayers things improve for you. And you should be very proud of your son. A nice looking young man, with an interesting future. Sons are so special. Enjoy a wonderful weekend. Here the promise of some long lost SUNSHINE and warmer temps. The dreary days are about to do me in, but always Light at the end of the tunnel. Your coloring skills are superb. I love the hummingbird page. Have fun watching the football game and Happy WOYWW! Gorgeous colouring, love the bird one and how you have coloured them differently despite the symmetry of the picture and I didn't even notice at first and it looks FAB. Thanks for visiting me BJ#49 sorry it took so long to reply.